Calypso is Canada's biggest theme waterpark. There is water fun to be had everywhere on our extensive 100-acre facility. From toddlers to teens, from thrill-seekers to grandparents, everyone will have their share of fun in this gem of a park. With imaginative management, this $65 million investment has been transformed into a hundred different water adventures to keep you cool and busy. Humungous state-of-the-art slides, a river run, Canada's largest wave pool, thrilling rides—even a whitewater experience! You won't have time to be bored. You wanted a wave pool that eclipses all others - we've got it. We've captured over an acre of ocean and set it free in our park. With several different types of waves, and easily accommodating 2,000 of your friends, Calypso Palace wave pool is where people gather to ride the good times. 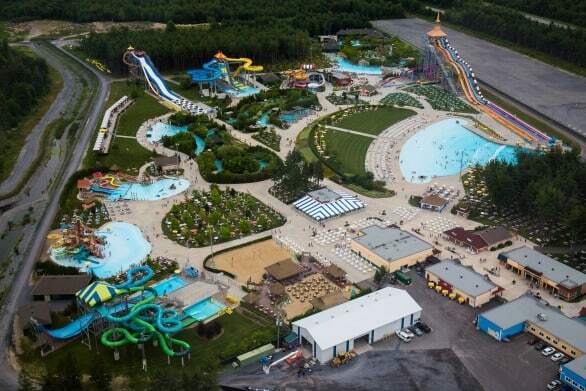 Calypso Theme Waterpark is the summertime place to be, just east of Ottawa off Highway 417 and 75 minutes from Montreal. So pack your swimwear and come on over. Don't worry; we have restaurants or landscaped picnic areas if you prefer to pack a lunch. There's also a souvenir shop, VIP Zone, dairy bar, cafeteria, restaurant, Hawaiian Beach Bar, lounge chairs, plenty of room to enjoy a good laugh and of course, excitement galore. Every inch of this place is injected with fun. No, we haven't forgotten our smallest friends, toddlers; we have a safe haven for you, too. Share the best summer moments ever; bring a friend and soak up the fun.